Hubby and I are thankful that our daughter was able to avail a scholarship for without it there is no way we could enroll her to the university she now loves. We are paying half of the tuition every term. It’s still a big amount considering that we only rely on my husband’s salary and some commission that he receives not for wholesale printing but from computer to plate services. We are keeping our options open in case something affects my daughter’s scholarship. But my daughter is really determined to keep her scholarship by studying hard. Here’s the proof of her being a hardworking student. We are proud of her. This entry was posted in College life and tagged grade for midterm, midterm, scholar, scholarship, university life on November 29, 2013 by Yami. Galing nya! 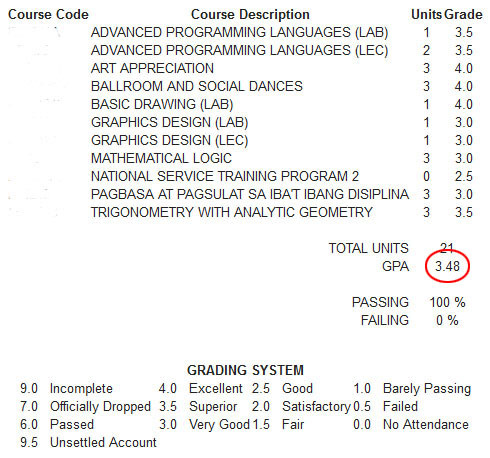 Ang tataas ng grades.